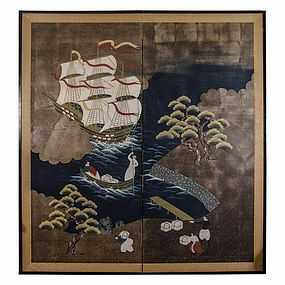 A beautifully painted Meiji Period Japanese Namban screen depicting a Portuguese Caravel ship. Japanese screens featuring Portuguese are rare. 60h x 56w inches, 152h x 142w cm. 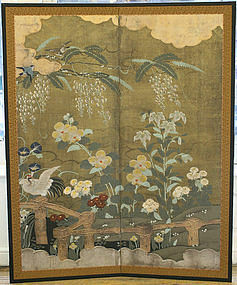 A very rare Momoyama Period masterpiece Japanese two-panel screen with chrysanthemum and other flowers and foliage. Exquisitely painted on gold leaf, with original sumptuous silk brocade. 72w x 21h inches, 183w x 53h cm. 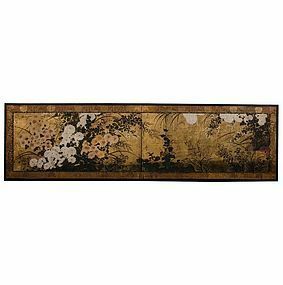 A fantastic two-panel painted Japanese screen with a colorful floral design all on silver leaf mounted on wood with wood frame. 50w x 48h inches, 127w x 122h cm. Japanese Late Edo Period 19th Century Silver Rimpa Flower Screen, a fine masterpiece. Rimpa School represents the highest standard of decorative painting of all schools of Japanese painting. The flowers and other elements are raised by the use of Gofun (oyster shell lacquer). The flowers seem to jump from the silver field. This finely painted masterpiece features wonderful color on silver leaf. Each Panel: 51h x 24.25w inches, 129.5h x 61.5w cm; Total Dimensions: 51h x 97w inches, 129.5h x 246w cm. 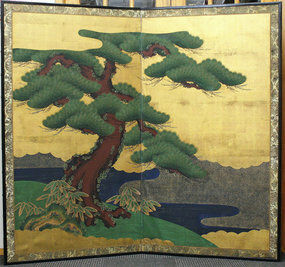 Rare 18th Century Japanese Tea Ceremony Screen Painting of a Pine Tree. Exquisite painting on gold leaf. Set in a wood frame with a sumptuous silk brocade border. Featuring two poems on the back. The Japanese tea ceremony, also called the Way of Tea, is a Japanese cultural activity involving the ceremonial preparation and presentation of matcha, powdered green tea. Frame: 26 x 19 inches, 66 x 48.25 cm; Painting: 21 x 13 inches, 52.25 x 33 cm. Finely Painted Six-Panel Crane Screen, in various poses with leaves and flowers on a charcoal silver background. A highly styled creation of the Taisho Period. Taisho screens are very much sort after today for their unique beauty and the way that they complement a contemporary setting. Each Panel: 30h x 13w inches, 76h x 33w cm; total Dimensions: 30h x 80w inches, 76h x 203 cm. 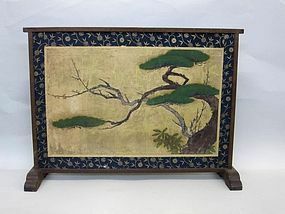 18th Century Japanese Two Panel painted Screen of a Pine Tree and Landscape, set in gold painted clouds floating in the image. An exceptional classic Japanese masterpiece. The presence of this image changes with the light of the room. The painting techniques are sumptuous, giving the image a heightened realistic experience. A similar screen was sold by Liza Hyde to the Rockefeller collection. Height: 74.75 inches, 190 cm; Width: 67.25 inches, 171 cm. 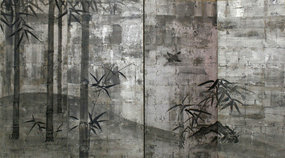 A rare late Edo Period four-panel silverized Japanese Screen. A fine scholar's composition of bamboo, rocks, and a swallow in flight. A beautifully painted sumi, with a fine oxidized silverized patina. It appears to have the original brocade frame. The screen is in extraordinary condition for its age. A superb, museum quality screen and an important find. Height: 40 inches, 101.5 cm; Width: 72 inches, 183 cm. 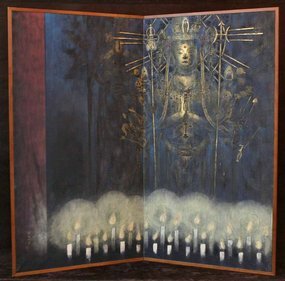 The inscription on the back reads: Inori (Meditation) by Kinugawa Masayoshi (born 1912 in Higemi, Hyogo) of the Bijyutsuin Inyuu art organization. Japanese Two Panel Screen painting of Kannon Bodhisattva, the Goddess of Compassion and Mercy. The painting is a masterpiece, using the technique whereby minerals and semi-precious stones are ground into the paint, creating the most spectacular effects. Also, gold and black lacquer add highlights. This marvelous piece will stand out in any environment. 74h x 68w inches, 188h x 172.5w cm. 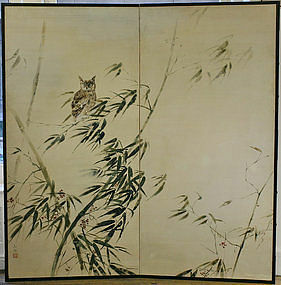 Japanese Late Meiji Period Two Panel Owl Screen featuring a solitary owl perched on a wind blown bamboo, entwined by vines with clusters of red berries. Signed by Kouro. Nihonga School - ink and color on paper painting in tarashikomi, a technique that achieves shading through pooling successive layers of partially dried pigment. 68.5 inches (174 cm)h x 67 inches (170 cm)w. Very Good Condition. Minor Repairs. From a prominent and widely exhibited collection. 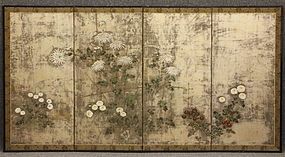 19th Century Japanese Late Edo Period Two Panels Rimpa Flower Screens. Rimpa School represents the highest standard of decorative painting of all schools of Japanese painting. The flowers and other elements are raised by the use of Gofun (Oyster Shell Lacquer). This masterpiece features wonderful color with gilding and silver leaf. A great work of art. 67.5 inches (171.5 cm)h x 48 inches (122 cm)w. Very Good Condition. From a prominent and widely exhibited collection. 18th Century Japanese Two Panel Painted Screen. 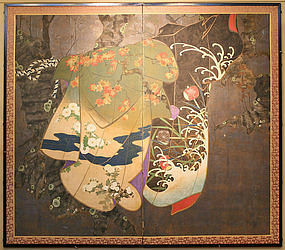 All four seasons are represented here, with the background representing Winter and the kimono patterns representing Spring, Summer, and Fall. This is an unusual and creative take on the tagasode (whose sleeves?) genre of screen painting that usually depicts interiors. The pair of kimono poetically speak of a romantic liaison. The colors are breathtaking and the painting technique is pure master work. 68 inches (173 cm)w x 60 inches (152.5 cm)h. Excellent Condition. From a prominent and widely exhibited collection. 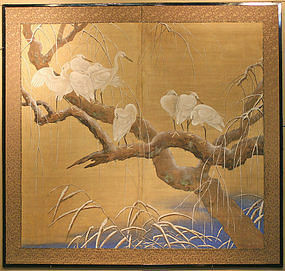 Japanese Two Panel Screen of Snow Cranes on a Willow Tree. This great masterpiece is one of the most amazing screen paintings we have seen. Each Snow Crane is painted with its own personality and attitude, using the finest pigments and Gofun (Oyster Shell Lacquer). All of the elements of this painting are just magical. 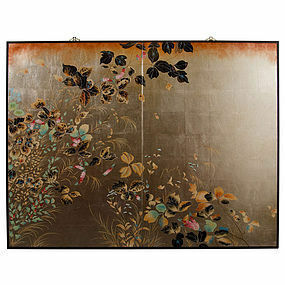 Brocade borders in a black lacquered frame make this two panel screen complete this work of art. 66 inches (167.5 cm)w x 62 inches (157.5 cm)h. Excellent Condition. From a prominent and widely exhibited collection. 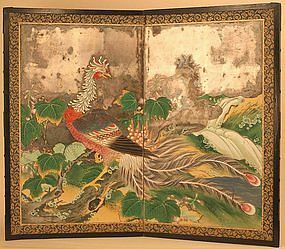 Early 18th Century Japanese Two Panel Screen Painting featuring a spectacular Phoenix. Exquisitely painted with silver leaf on paper. Original brocade borders. Screens this early are very rare, and screens of these proportions are rarely seen. 28 inches (71 cm)w x 24 inches 61 cm)h. Good Condition. From a prominent and widely exhibited collection.